The publication Minne Inno focuses on promising innovation and has published an article spotlighting our effort to "convert pig livers, kidneys, hearts and pancreases into fully-functioning human organs." The Atlantic has featured Miromatrix in an article about how large pork businesses are creating new company units that will work with medical organizations interested in using pig tissues for medical devices and whole organ therapies. The article highlights Miromatrix’ technology, our wound matrix and the development of transplantable organs based on our patented technology. 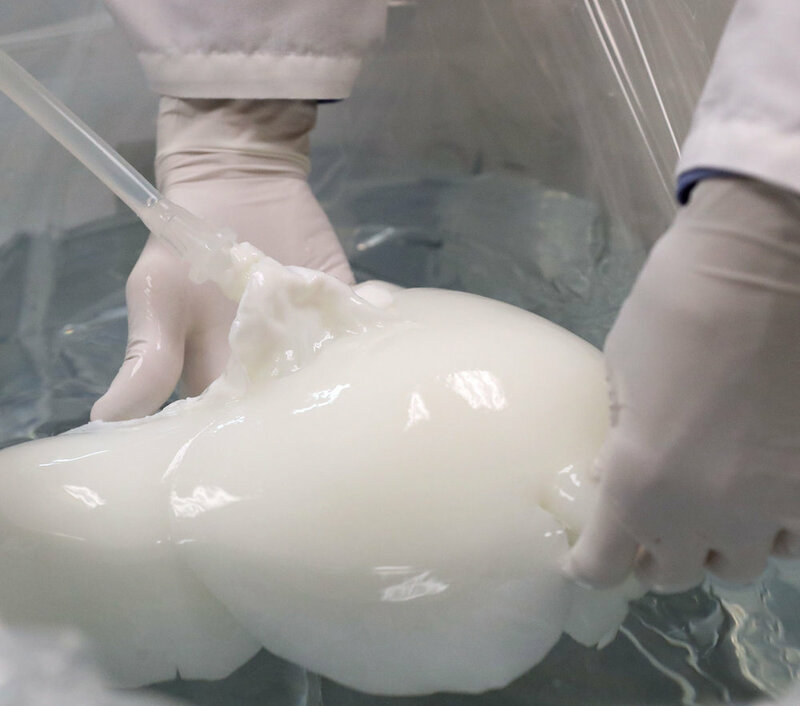 As the promise of fully biologic organs grows nearer we are excited to see porcine industry leaders, such as Smithfield Foods and Johnsonville, create entire biologic divisions to address the growing need for high-quality organ procurement for the medical market. Keeping the structure of the protein scaffold is important, which is why the company has special partnerships with local farms and slaughterhouses. “We make sure it doesn’t have any nicks and cuts it (sic), which takes a little bit of training,” says CEO Jeff Ross. He says the company is aiming to achieve the first human implant sometime in 2020 or 2021. Miromatrix Medical Inc., a biotechnology company engaged in the development of fully biological human organs to solve the chronic shortage of transplantable organs, utilizing its patented perfusion decellularization/recellularization technology, as well as organ-derived biological products for soft tissue reinforcement and advanced wound care, announced today that they have been awarded a Federal Supply Schedule (FSS) contract to sell their product, MIRODERM® in all government facilities (e.g. VA Hospitals, DOD, etc.). The MIRODERM family of products are acellular wound matrices derived from porcine liver and are intended for the management of wounds including: partial and full thickness wounds; venous and diabetic ulcers; surgical and trauma wounds, among others. The earning of this contract adds MIRODERM to the existing contract that Miromatrix was awarded on December 1, 2016 for MIROMESH® (Contract Number V797D-70029). Miromatrix Medical Inc. is a biotechnology company engaged in the development of fully biological human organs to solve the chronic shortage of transplantable organs, utilizing its patented perfusion decellularization/recellularization technology, as well as organ-derived biological products such as MIROMESH® and MIRODERM® for soft tissue reinforcement and advanced wound care. Miromatrix’ perfusion decellularization/recellularization technology is protected by a series of issued patents and pending patent applications in all major markets around the world. In addition to MIROMESH and MIRODERM, internal development programs at Miromatrix focus primarily on creating fully implantable human organs including livers, kidneys and heart products with collaborators including The Mayo Clinic, Texas Heart Institute and Mount Sinai Hospital, and aim at eliminating the organ transplant waiting list. We are delighted to announce that Paul Buckman, John Erb, and Mark Wagner have joined the Miromatrix Board of Directors! Collectively they bring over a 100 years of leadership experience in successfully developing and commercializing medical devices and medical technologies. The willingness of these professionals to serve on the Board demonstrates their excitement about the remarkable potential of Miromatrix devices and technology to save lives and transform medicine. It also highlights the Company’s compelling combination of a robust patent portfolio matched with exceptionally talented and dedicated people. We are very excited about Mr. Buckman, Mr. Erb and Mr. Wagner joining the Board. Miromatrix Medical is honored to announce that it has been awarded a Vizient Innovative Technology contract. Vizient is "the largest member-owned health care company in the country and is dedicated to leading health care innovation, creating knowledge and fostering collaboration to help our members thrive." Click to read the full press release and watch the video below. Digital Trends, a publication focused on understanding how new technology effects our lives, published an article about Miromatrix. "Our goal is nothing short of eliminating the organ transplant waiting list and saving the lives of the thousands of people who die each year waiting for an organ replacement." Click to read the article published by Digital Trends. Futurism is a publication that covers the breakthrough technologies and scientific discoveries that will shape humanity’s future. Futurism posted a short video about Miromatrix’ patented organ technology and how they hope to save lives with it. View the video here or click here. Motherboard is a publication that seeks to uncover the tech and science stories that define what's coming next. "Reprogramming Organs Could Be the Future of Transplants"
Motherboard wrote a small article about Miromatrix' goal of eliminating the organ transplant waiting list. The U.S. Centers for Medicare and Medicaid Services (CMS) has granted a HCPCS code (healthcare common procedure coding system) for MIRODERM® Biologic Wound Matrix, a non-crosslinked acellular wound matrices derived from porcine liver and indicated for the management of wounds including: partial and full thickness wounds; venous and diabetic ulcers; surgical and trauma wounds among others. A HCPCS code is a required for reimbursement in the CMS and other health insurance program systems. Miromatrix Medical Inc is a biotechnology company engaged in the development of fully biological human organs to solve the chronic shortage of transplantable organs, utilizing its patented perfusion decellularization/recellularization technology, as well as organ-derived biological products for soft tissue reinforcement and advanced wound care. The National Science Foundation caught up with us at the 2016 BIO International Convention and highlighted our tech. "Dominique Seetapun, Ph.D., Miromatrix’ senior project development scientist, says the new technique improves upon existing technologies, which largely immerse organs in detergents that also degrade organ scaffolds, and complicate the growth of new cells into functional tissues and organs. Instead of submerging organs entirely in detergent, Miromatrix instead pumps the decellularization solution through the blood vessels, removing cells in less time and avoiding degradation of the scaffold, she says. The organs then can be recellularized and transplanted using current organ transplantation techniques." Click on the link to read the article or watch the video. Miromatrix Medical Inc., a biotechnology company engaged in the development of fully biological human organs to solve the chronic shortage of transplantable organs, utilizing its patented perfusion decellularization/recellularization technology, as well as organ-derived biological products for soft tissue reinforcement and advanced wound care, announced today that they have been awarded a Federal Supply Schedule (FSS) contract to sell their product, MIROMESH® in all government facilities (e.g. VA Hospitals, DOD, etc.). The earning of this contract further accentuates the innovative nature of MIROMESH, as it is the only highly vascularized porcine liver-derived biologic soft tissue reinforcement mesh in the world. Pending review, MIRODERM®, Miromatrix’ porcine liver-derived biologic wound matrix is expected to be added to the contract in Q2 ’17. Baltimore Fox45 News Covers Miromatrix Medical Inc.
"The medical procedure is called xeno-transplantation. It is where animal organs are used in the human body. Doctors explain that the size of the pig and the easy reproduction of the animal make it a perfect candidate." Click the link to read the news article or watch the video. KARE 11 news covered Miromatrix' vision and progress towards a transplantable organ. "This finding could change lives for the millions of people who need transplants." Click the link to read the article and watch the story. Miromatrix is proud to announce the recent publication of “Eliminating the Organ Transplant Waiting List - The Future with Perfusion Decellularized Organs” authored by Miromatrix’ Dominique Seetapun, Ph.D. and Jeff Ross, Ph.D. in the premier peer-reviewed journal SURGERY. This publication highlights the ability of Miromatrix’ patented technology to address the chronic need for transplantable organs. Perfusion decellularization is a method that utilizes the native vasculature, ducts or cavities of any solid organ to decellularize an organ and leave behind an extracellular matrix (ECM) scaffold with the native architecture, vasculature and biochemical markers intact. It has advanced tissue engineering from thin constructs to the engineering of whole organs. In 2014, 20 patients died every day in the U.S. while waiting for an organ on the organ transplant waiting list. Patients who receive organ transplants are subject to the possibility of rejection and life-long immunosuppression. Perfusion decellularized organs have the potential to provide an ideal scaffold for recellularization and development of whole functional non-immunogenic transplantable organs. This review provides an overview of perfusion decellularization, progress in the field of whole bioengineered organs as well as potential future therapies that can be developed using perfusion decellularized scaffolds. Click to view or download the peer-reviewed article published in the journal SURGERY. Miromatrix was honored to be on the front page of November 2016's Twin Cities Business Magazine. Dale Kurschner (Editor in Chief) writes "[...] Miromatrix will gain market share, and eventual market dominance, in the areas where it’s focusing its efforts because of its proprietary technology: It is the only company in the world that can run fluids through an organ’s own vascular structure to flush out all of its cells, and then reverse the process with a patient’s cells before transplanting part or all of the organ into his or her body. And the process does it so well, the organ retains everything needed for it to be infused with cells and brought back to life. No one else has perfected this." Miromatrix Medical Inc., a biotechnology company engaged in the development of fully biological human organs to solve the chronic shortage of transplantable organs, utilizing its patented perfusion decellularization/recellularization technology, as well as organ-derived biological products for soft tissue reinforcement and advanced wound care, announces that MIROMESH®, the only liver-derived biologic mesh indicated for soft tissue reinforcement, has surpassed 1,000 units shipped. MIROMESH was launched in September 2014 and was created using Miromatrix’ proprietary perfusion decellularization technology. Also this month, the combined shipments of MIRODERM®, MIRODERM® Fenestrated, and MIRODERM® Fenestrated Plus surpassed 500 units shipped. The MIRODERM products are non-crosslinked acellular wound matrices derived from porcine liver and are intended for the management of wounds including: partial and full thickness wounds; venous and diabetic ulcers; surgical and trauma wounds among others. A Case Series of Hard to Heal Diabetic Foot Ulcerations and Venous Leg Ulcerations Treated with Perfusion Decellularized Porcine Hepatic Wound Matrix After Failing Other Advanced Modalities (CS-119, Liden). Miromatrix Medical Inc. is engaged in the development of fully biological human organs for transplant, as well as a family of organ-derived biological mesh products based upon its proprietary perfusion decellularization/recellularization technology, announces the completion for enrollment for its multi-center prospective clinical trial for the evaluation of hernia recurrence requiring reoperation after receiving MIROMESH® implantation. Enrollment for the clinical trial ended with 42 patients spread out over 6 different centers. MIROMESH® is a novel, non-crosslinked, acellular mesh derived from the highly vascularized porcine liver. By using the whole liver, MIROMESH is able to retain the liver’s native architecture, vasculature and tissue structure. This study will serve to provide clinicians with high-quality data in order to provide them with a higher degree of confidence when selecting MIROMESH® for hiatal hernia repair.